The Dutch foreign minister has said Serbian officials have told him war crimes suspect General Ratko Mladic might be ill and seeking to surrender. Bernard Bot, who visited Belgrade this week, said authorities told him Gen Mladic might be trying to negotiate his surrender with his own entourage. 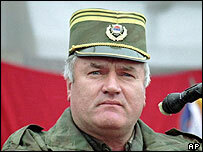 The move follows a flurry of reports from Serbian media suggesting that Gen Mladic may be ready to give himself up. The former Bosnian Serb commander faces war crimes charges, including genocide. Dutch foreign ministry spokesman Dirk Jan Vermeij said Mr Bot heard Gen Mladic was not well. "The minister said that he heard during meetings in Belgrade that Mladic is sick, but that the Serbs don't know where he is," Reuters news agency quoted him as saying. "The rumour Bot picked up was that Mladic was negotiating with his entourage." However Carla del Ponte, the UN's chief war crimes prosecutor at The Hague, told the BBC that Gen Mladic was within "immediate reach" of the Belgrade authorities. She said she believed they could capture him "today, if they want". On Wednesday she said there was no indication yet that Gen Mladic's surrender was being negotiated. The EU's Enlargement Commissioner, Olli Rehn, warned Serbia on Thursday that its talks on closer ties with the EU would be disrupted if it failed to co-operate fully with the United Nations war crimes tribunal in The Hague. He told a committee of the European parliament that co-operation meant delivering Gen Mladic to The Hague. Gen Mladic has been indicted over the siege of Sarajevo, which claimed at least 10,000 lives, and the 1995 Srebrenica massacre, in which at least 7,500 Muslim men and boys were killed. It was the worst atrocity in Europe since World War II.